G-SHOCK announces the new GBA800 urban sports themed models for athleisure wear. The watch itself and its Bluetooth® communication capabilities are designed and engineered to make sports activities even more fun. Linking with the G-SHOCK Connected phone app provides access to a number of functions to support your workouts. Daily health and fitness support functions include a 3-axis accelerometer that keeps track of your step count, a Countdown-Timer that lets you create up to 20 timer combinations of five timers each, memory for up to 200 lap records and more. 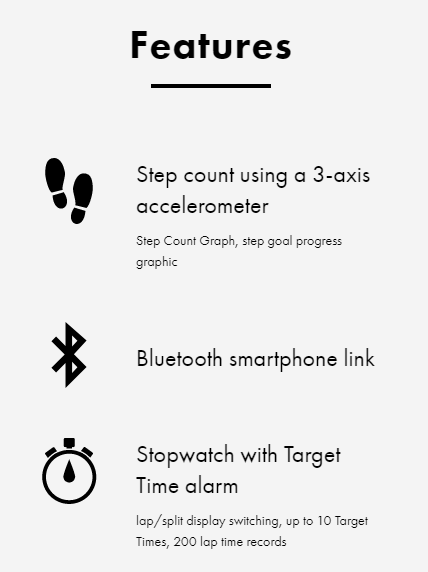 While linked with the G-SHOCK Connected phone app, you can configure settings for a step count log with five exercise intensity levels, calorie calculations, and step targets. The ability to use the app to create timer combinations and send them to the watch, to store stopwatch measurement data, to view data and more all combine to help you plan and record your workouts, making them more effective and enjoyable. Other features include app-based auto time setting correction and other features for more efficient timekeeping, and an Auto Double LED Light to facilitate workouts in areas where lighting is dim. The small cases of these models are great for active training. Back wings on the inside of the bands where they connect to the case, a new band ring shape that prevents sliding, more band holes to allow better tightness adjustment, and a soft urethane band, which maintains its suppleness even after long wear all add up to a more comfortable fit. A mid-size design that's optimal for running and training, Bluetooth®, phone app linking and much more makes the GBA800 the perfect choice for everyday wear and fitness training.